Direct them to this page or distribute our call for abstracts flyer with details and dates. 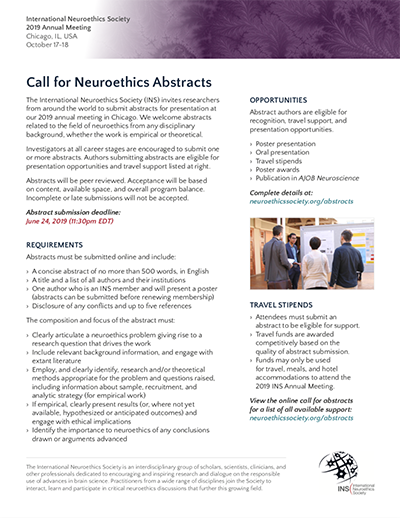 The International Neuroethics Society (INS) invites researchers from around the world to submit abstracts for presentation at our 2019 annual meeting in Chicago, IL, USA. The meeting will feature a wide range of exciting talks, discussions, and networking opportunities with experts, researchers, and up-and-coming leaders in the field of neuroethics. This is an opportunity to share your neuroethics research with international colleagues who are actively aligning ethics, law, society, and policy with advances in neuroscience. We welcome abstracts related to the field of neuroethics from any disciplinary background, whether the work is empirical or theoretical in nature. Investigators at all career stages are encouraged to submit one or more abstracts. Abstracts will be peer reviewed. Acceptance will be based on content, available space, and overall program balance. 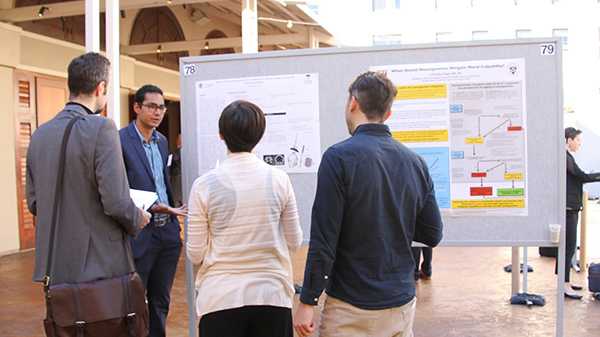 Poster presentations will take place on Thursday and Friday, October 17 and 18, 2019; opportunities for oral presentations will also be available, with details to follow. The submission deadline is June 24, 2019, at 11:30pm EDT. Incomplete or late submissions will not be accepted. All submissions must be made through the abstract submission form. Abstracts submitted by the deadline may be considered for the following opportunities. To be eligible, authors must indicate their interest in each of these following opportunities when completing the online submission form. Authors must be INS member in good standing to accept the opportunities offered by the INS Program Committee, however they do not need to be members of the INS at the time of their submission. Outdoor poster presentation space in San Diego. Poster Presentation – Authors of accepted abstracts who will attend the meeting are expected to present a poster (if not selected to give an oral presentation). Poster presentations will be on Thursday and Friday, October 17 and 18, 2019. When preparing your poster, please keep the dimensions no more than 48 inches wide by 36 inches tall (about 1.2 meters by 0.9 meters), size the title and the text so it can be read from several yards away (approximately 60 point font for the title and 24-36 point font for the body text), avoid large sections of text, and use images, charts, figures and bulleted lists when possible. Oral Presentation – A number of authors will be invited (on the basis of abstract topic and quality of submissions) to speak about their research. We will release information about the presentation format and selection process for these presentations at a later date. Authors who are selected will not be expected to present a poster. If you or your institution would like to sponsor a stipend, contact Karen Graham. Your support is critically important for students and early career professionals traveling internationally. If you are interested in serving as a poster judge, contact Kimberley Glover. Travel Stipends – Funds to support travel to the 2019 INS Annual Meeting are awarded competitively based on the quality of abstract submission determined by the Program Committee. You must submit an abstract to be eligible to receive support. To be considered for a travel stipend, please indicate from which country you will be traveling to the meeting when completing the online abstract submission form. Poster Awards – Top poster presentations will be selected to receive prizes. Authors will present their posters on Thursday and Friday, October 17 and 18. Attendees will also be able to vote for their favorite poster presentation. Only abstract authors with an accepted submission will be considered for the available travel stipends. Funds may only be used to attend the 2019 INS Annual Meeting in Chicago. Original receipts for air travel and hotel accommodations are required for reimbursement. AJOB Neuroscience – Accepted abstracts will be reviewed by the editors of AJOB Neuroscience and ranked according to novelty, relevance, and contribution to the field of neuroethics. Up to 25 abstracts will be identified for inclusion in a future issue of the journal. INS is not responsible for ensuring that final drafts of abstracts are received by AJOB Neuroscience or published in the journal. INS Publications – Accepted abstracts will be listed on the INS website and all oral and poster presenters who confirm their participation by September 9 will be included in program materials. Unless otherwise requested, INS reserves the right to publish titles, authors, affiliations, and the full text of submitted or accepted abstracts on the website or any other digital or print publication. All abstracts must be received through the online abstract submission form before the deadline. Incomplete or late submissions will not be accepted. If necessary, please send via email ([email protected]) a PDF version of any abstract containing charts, images, or text formatting essential for the review process. Become an INS member by completing a membership application. Members are eligible for discounted registration rates and many other benefits. In awarding special recognition such as travel stipends, the Committee looks for abstracts displaying particular novelty or merit, while also taking other factors into account. At least one author must be an INS member who plans to attend the meeting and present the abstract. If an author cannot present, an INS member knowledgeable of the abstract and research may present it on their behalf. All oral and poster presenters must confirm their participation and register by September 17 to be included in program materials. Abstracts are reviewed by members of the Program Committee and their appointees from within the Society. The committee will select high-quality abstracts to receive special recognition. Their decisions on acceptance, travel stipends, and other recognition will be final. The committee is not obligated to provide feedback to abstract authors regarding final decisions. To submit an abstract, complete the online abstract submission form and supply all required information. The submission deadline is June 24, 2019, at 11:30pm EDT. Incomplete or late submissions will not be accepted. Authors will receive an email within 48 hours confirming the receipt of their submission and confirming it meets minimum requirements. Notification regarding acceptance will be emailed to authors by August 7. Recipients of the travel stipends, oral presentations, and other recognition will be notified individually by email and expected to confirm their acceptance within one week. All presenters will be announced by August 22 in the INS newsletter. If you have trouble submitting your abstract through the online form, or have any questions about the submission requirements or process, please contact staff by email ([email protected]). If you are unable to submit your abstract using the online form on the day of the deadline, abstracts received by email before the deadline will be considered timely. Authors retain the right to rescind their submission from consideration or request that their abstract not be published online or in any print materials. 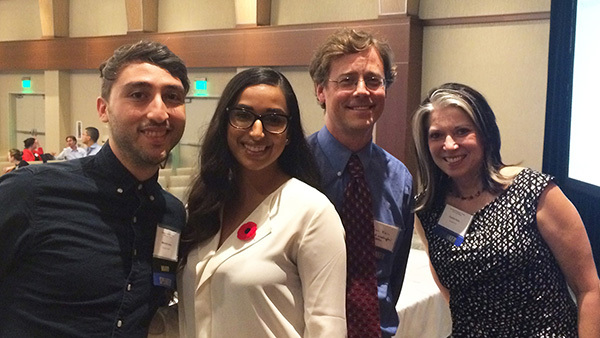 Abstract presenters at the 2016 INS Annual Meeting, left to right, Marcello Ienca, Jasmine Tung, Eran Klein and Cynthia Kubu. Authors are responsible for reporting any real or perceived financial conflict of interest. A brief disclosure and conflict of interest statement should be submitted with the abstract and viewable on the poster. Any potential for financial gain that may be derived from reported work may constitute a possible conflict of interest. Disclosure is required in any case in which an individual or company stands to benefit financially from research performed. Therefore, each author must indicate any benefit to an individual or company that may potentially lead to financial reward. Disclosures should appear on the bottom left corner of the poster and may follow the recommended format: "Disclosures: None" or "Disclosures: The author(s) disclose a relationship with..."
INS Stipend – The International Neuroethics Society (INS) is offering travel stipends to support authors of top quality abstracts to attend the 2019 INS Annual Meeting. To be eligible to receive this stipend, individual researchers must submit an abstract for presentation at the INS Annual Meeting. Submitted abstracts must meet all requirements outlined in the call for abstracts and be accepted by the INS Program Committee. Only abstract authors with an accepted submission will be considered for the available travel stipends. Funds may only be used to attend the 2019 INS Annual Meeting in Chicago. Original receipts for air travel and hotel accommodations are required for reimbursement. For additional information about the stipend or the distribution of stipend funds, please contact Kimberley Glover ([email protected]). If you or your institution would like to sponsor a stipend, contact Karen Graham ([email protected]). Your support is critically important for students and early career professionals traveling internationally. The International Neuroethics Society is an interdisciplinary group of scholars, scientists, clinicians, and other professionals dedicated to encourage and inspire research and dialogue on the responsible use of advances in brain science. Practitioners from a wide range of disciplines join the Society to interact, learn, and participate in critical neuroethics discussions that further this growing field.